The group becomes the first company in Scotland to manufacture, timber, aluminium, PVCu and glass products to the commercial, trade installers and construction industries. This development follows the recent consolidation of Merlin Network (Scotland) into the group along with the formation of Blairs Aluminium Systems in 2016. 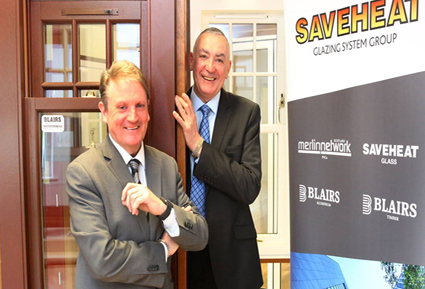 The group also comprises Saveheat Glass and Blairs Timber Windows. Merlin Network’s expertise is in the window and conservatory sectors, while Blairs Aluminium Systems offers aluminium glazing systems. Saveheat Glass is a leading manufacturer of insulating glass units, whereas Blairs Timber Windows has been providing high quality timber windows and doors since 1913. Industry experts Alex Gray and Colin Torley are behind the move. Managing director, Alex Gray, described the development as "significant" for the businesses. The group employs 150 staff across four manufacturing locations in the central belt of Scotland. It has a current turnover of over £16million. It delivers window and glass solutions for a variety of contractors, architects, builders and trade customers, ranging from bespoke arch-fronted timber windows for the Apple store in Buchanan Street, Glasgow, an office development in Harley Street, London, a £250,000 aluminium and glass project for a large customer in Oxford Street, London through to a £150,000 aluminium and glass project for an animal house in Flamingo Land in North Yorkshire to PVCu window solutions for trade installers and housing associations throughout Scotland.